What To Do in the Rain while Boondocking? Wash the RV! What To Do in the Rain while Boondocking? Wash the RV!! Did I mention that Texas has been giving us extreme weather lately? First she tried to freeze us out, covering our buggy in ice. Icicles on our rig – wow! And look at that layer of grit and grime! Then Texas dumped a bunch of snow on us. 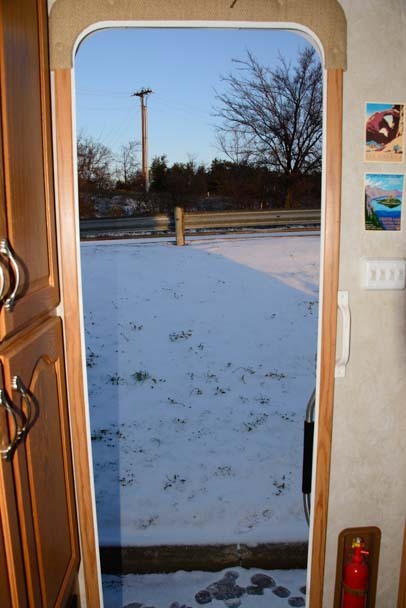 We opened the RV door one morning to find ourselves surrounded by the white stuff! Right up to our door! You never know what you’ll get for winter weather in Texas! This eventually turned to rain, and we drove a few hundred miles on roads that spat all kinds of miserable black grime all over the rig. When we finally stopped in Livingston (for a few days of drizzle and fog! ), our beautiful home was a dirty mess!! Of course, it began to rain again and then it began to pour. What to do while boondocking in the rain rather than just forlornly wishing you could play outside? Clean the rig !! After all, the pre-rinse had already been done, and all the sticky things (like bugs!) were nicely unstuck by now. Mark got out his favorite telescoping brush that did us such great service on the boat, and he spent two hours in the pouring rain sudsing up the truck and trailer and letting the soft rain water rinse it all off. Clever! After the rain stopped (not that it was sunny… just not raining), the rig dried off and now sported a wonderful shiny luster, thanks to a wax job we got back in Florence, AZ. We were very happy campers, especially Mark, who had worked so hard and gotten so drenched in the rain. But then it was time to move on. Our aim was to get out of Texas and go east. But this crazy state wouldn’t have any of that. 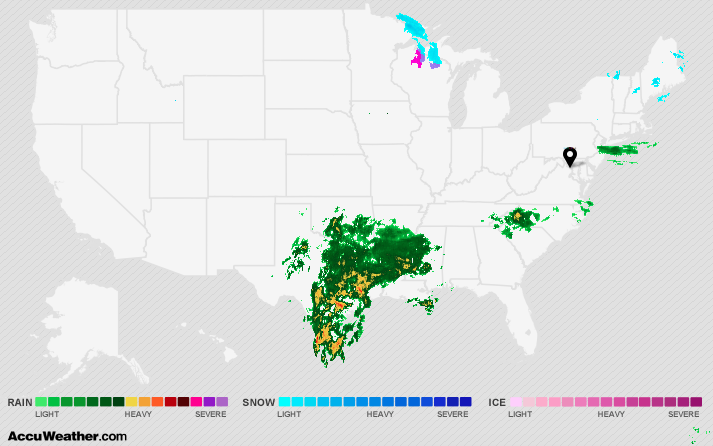 While the rest of the country basked in clear skies, Texas persuaded her neighboring states to the east to join her in taking a good long bath. Good grief! We waited for a few days for a weather window, and it finally seemed to come. At least, it came long enough for us to escape a little ways east of Houston. So we ran for it. Big mistake! Out on I-10 the skies began to spit. We slipped into the first rest area we could find. Mark was crestfallen as he inspected the RV in the drizzle. The whole thing was covered in a thin layer of road grit. His wonderful washing job was history. Ugh! What to do while waiting for the rain to stop? Aw, heck — wash the RV! 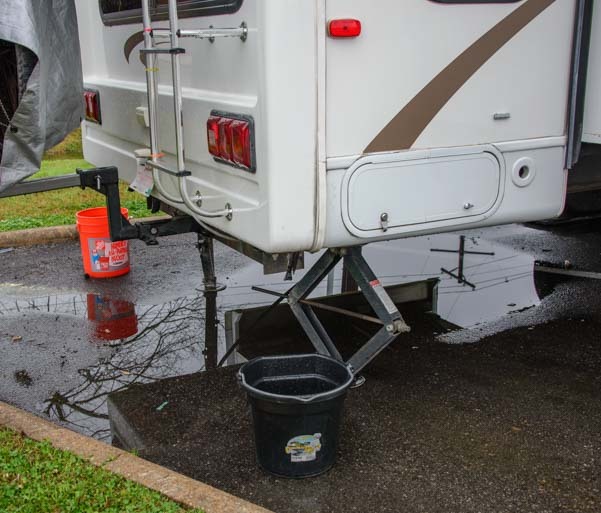 We didn’t have a water source, so we put our two buckets behind the back of the fifth wheel to catch the rainwater that was falling in a steady stream from the gutters. They filled up in no time. We also didn’t need any soap. 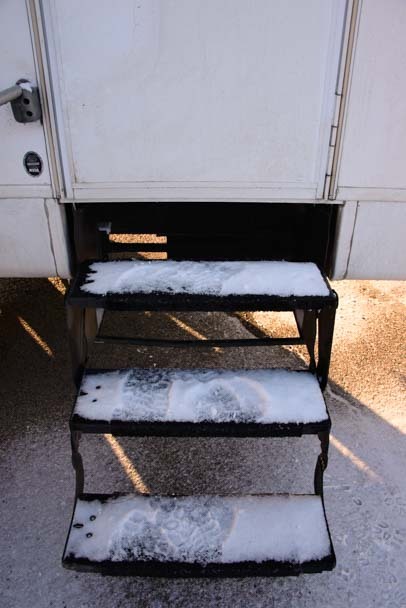 The dirt was primarily on the bottom half and was already streaming down the sides of the trailer! Our buckets were soon overflowing with rain water! We try to avoid dividing the labor in our buggy into pink and blue jobs as much as possible, preferring to find some shade of lavender for all the chores that need to be done. So, now it was my turn to get wet. Out I went into the drizzle to bring a little shine back to our RV and to try to put a smile on Mark’s face. It didn’t take much effort, just a little elbow grease and a nice upper body workout. Then our truck and trailer were sparkling clean again. Mark absolutely loved it. He got to enjoy the whole process with a beer in hand, and he didn’t have to lift a finger. Ha! He sure gets a kick out of watching me work!! I get the new layer of road grit off the rig while Mark enjoys a beer and a laugh! As I mentioned above, the great thing about rain water is that it is soft water and it doesn’t spot. There’s no need to wipe down the windows! The key, though, is to wash the rig before it stops raining so you get a good natural rinse. 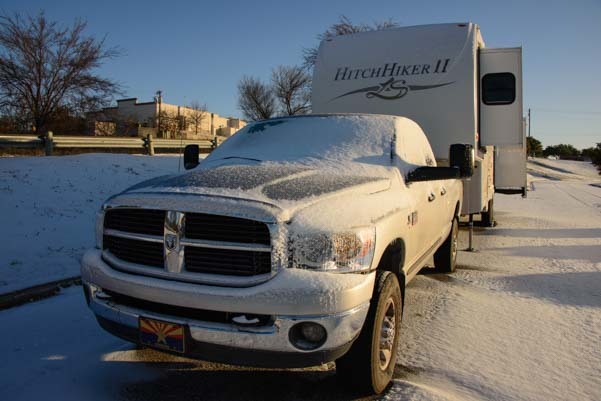 Next morning the roads were dry, and our clean truck and trailer hit the road once again. 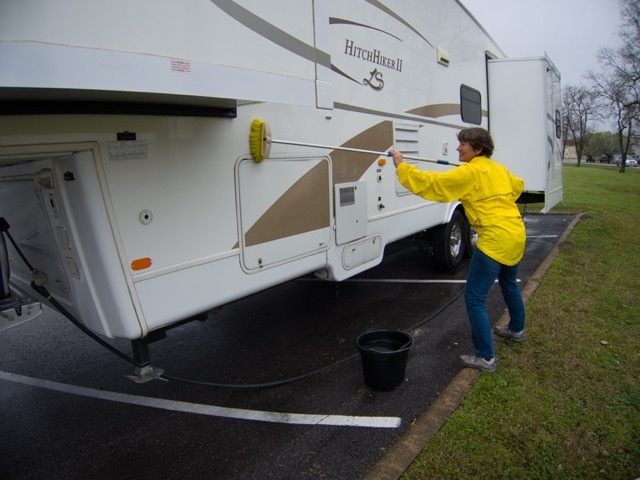 If you find yourself sitting in the rain in a soggy, dirty buggy, and you want to play outside and knock out a chore at the same time, throw a bucket or two under the RV’s gutters, and give your baby a wash! 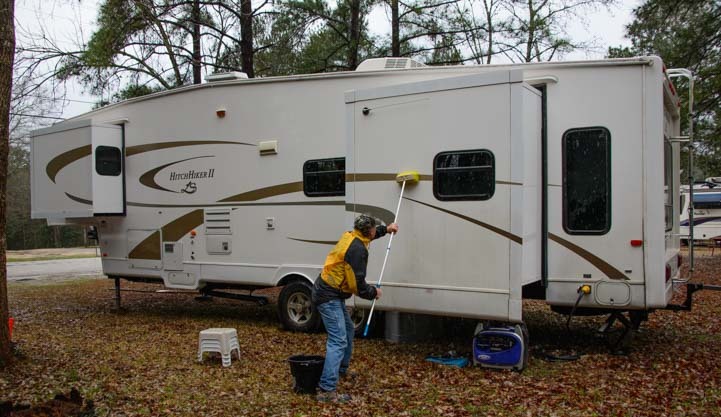 Tips for washing your RV in the boondocks – It’s trickier when it isn’t raining, but it can still be done! Boondocking tips for living off the grid in an RV – Things we do to save electricity and water in our life off the grid. How to find RV boondocking locations – Some great resources for finding free places to camp. A Winter Ice Storm on I-20 in Texas – Chaos on the Freeway! 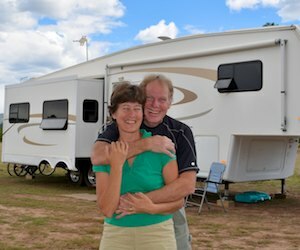 This entry was posted in The Full-time RVing & Cruising Lifestyles and tagged Boondocking, Full-time RV Lifestyle, New, Non-Travel, Other Tech Tips by Roads Less Traveled. Bookmark the permalink. I am like a kid when your post comes up. Glad your having fun, rain or shine. Good for You both! “Whether the weather be raining, whether the weather be hot, what ever the weather we will whether the weather, whether we like it or not”! WOW, that’s hard to type. Tell Mark, I was out on the Fat bike riding in the Colorado slush today, so much fun. Check it out, Salsa Blackborrow. Five inches of pure pleasure. Almost as much fun as rigwashing in the rain! A fat bike in Colorado slush — what great outdoor fun!! The Salsa Blackborrow is a beauty. Love the tongue twister — not just hard to type, but hard to read aloud too! I’m so glad you get a kick out of our posts… thanks for letting me know. It’s an amazing life! !